Paradoxically, you had me at hello. The Mundell-Fleming "unholy trinity" is that a small open economy can choose two, but not all three, presumably desirable policies: capital account openness, a fixed exchange rate, and monetary independence. Quite a lot of political economy research goes into figuring out which two countries will choose. But what do we call it when a country chooses none of them? Cyprus right now has a closed capital account, no monetary independence, and severe limitations on external exchange at any rate. I nominate "The Devil's Trifecta" but I'm not great at titling things so perhaps readers can do better. This is a nice way to think about just how screwed up the EU is right now: tasked with choosing one suboptimal policy, they choose three. But non-economists can play too! Take Rodrik's trilemma, in which states can choose two of national sovereignty, democracy, and economic integration. In Cyprus, the last is gone and the former two are questionable: it looks like democracy might win the day but it was dicey there for a minute, while Cyprus's sovereignty is restricted by the EU and faces a possible threat from Russia. So let's score it a 1.5 with a negative outlook. Posted by Kindred Winecoff at 7:49 AM . 1. Is it your argument that peripheral crises can never lead to systemic crises? 2. Is your answer to #1 completely independent of crisis response policies? My response to #1 is that the likelihood is exceedingly low. I base that on the fact that not a single peripheral crisis* from 1970-present (using the IMF's database) has turned into a systemic crisis. Obviously crisis management policies have varied quite a lot, but the global (i.e. systemic) outcome has not. That leads me to believe that policy considerations are not very important from the perspective of preventing systemic contagion from peripheral crises. In peripheral crises, policy matters a lot locally -- i.e. for the peripheral country experiencing the crisis and maybe one or two others connected to it -- but not systemically. In systemic crises, policy in the core matters a lot globally; policy in the periphery matters less**. @whinecough @dandrezner So if ridiculous policy enacted, you wouldn't worry (see first proposal)? Glad policymakers didn't share that view. @whinecough @dandrezner You're right. I can't prove what would have happened under an alternative policy. But not willing to risk it. We went around like that for awhile. So here's my position: if policy mattered for global outcomes things would likely be much more worse right now than they are. Why? Because the Cyprus deal is basically the worst possible policy from the perspective of preventing contagion. Cyprus has been hacked off from the global financial system. Capital controls are in force. Its entire banking system has been closed for two weeks, its second-largest bank will be closed permanently, and its largest bank will be forcibly restructured. Foreign depositors, bondholders, and shareholders are being gutted. If you were trying to start a systemic crisis, this is the way you would do it: repudiate a huge chunk of claims, and close the capital account. And yet markets around the world are up today. Even in Russia. Or take the examples of Iceland and Ireland. Iceland repudiated the debt of its banks, imposed capital controls, and told international investors to take a hike. Once again, this is a recipe for contagion yet systemic crisis did not result. Ireland did the opposite: it guaranteed the debt of its banks, did not institute capital controls, and paid off international investors. Systemic crisis also did not result. The opposite local policy response produced the same global outcome. Only the local outcome varied. Contrast those cases (and all the other eurozone cases, and Argentina, and E Asia, and etc.) with the US in the Fall of 2008. A couple days of dithering -- of the sort that the eurozone has made its speciality -- lead to an immediate and profound downturn in global markets, including the largest single-day evaporation of wealth in absolute terms in history. The US tried to kick the can down the road, but couldn't because it is the core node; the EU has been able to repeatedly kick the can down the road because those crises are in the periphery. I conclude from this that policy always matters locally, but it only matters systemically when the crisis is in a core node. No matter what the policy response to peripheral crises is, systemic contagion is exceedingly unlikely. I am prepared to hear arguments counter to this, but they must go beyond assertion or "I'd rather not chance it". Evidence is preferable, but I'd even countenance an evidence-free logical argument with a clear causal mechanism. These are every bit as rare as the claim that systemic outcomes depend upon local policies is common. *Note that we're making it hard on ourselves by calling essentially every country but the US and UK "peripheral". This is not a common view (or was not prior to the crisis). Many thought that Iceland, Ireland, Cyprus, and other tax havens were significant global financial centers (or rapidly becoming so). We're not talking about Somalia here... we're talking about OECD countries. Yes, we realize this is a bold claim. We think we have evidence and argument to support it. **Remember that Spain was winning awards for prudential regulation a couple of years before the crisis. Ireland was held up as a model too. In the end that didn't help them. Are highly interconnected networks better at dispersing risk? It depends upon the type of risk. Suppose a toxin hits a network. If diluting the toxin across the network also dilutes its effects to practically nothing, then we want the network to be as large and interconnected as possible. When shocks hit they will be quickly diluted and rendered relatively harmless. But for toxins that are deadly in minute doses, toxins that kill whatever they touch even when they are highly diluted, we want the infected node on the network to be isolated as much as possible. This is, we believe, the dominant view of financial contagion in the social sciences and in particular in international economics. In the paper we cite several different formulations of this view in the academic and policy literatures. If we reiterated this view it would not be noteworthy, and it probably would not be publishable. We think our article is noteworthy (and was published) because it argues that this conceptualization of risk in networks is fundamentally misguided: it places undue focus on the strength of the shock and the density of the network, rather than the location of the shock and the topology of the network. To see the difference consider two shocks of equal strength which hit two networks of equal density. The only difference in the two networks is in the distribution of that density: in one of the networks the connections are distributed more or less equally -- most nodes in the network have about the same number of connections to other nodes -- but in the other network the connections are distributed very unequally -- a few nodes have a lot of connections, while most nodes have few. We believe that we should expect very different outcomes from the same shock and the same overall density because of different distributions of connections. All networks are not equal. Outcomes do not just depend on the strength of the toxin, but whom it contaminates. Oatley et al. argue that you get two kinds of financial crisis in this kind of world. First, you get financial crises in the periphery, which tend to be limited to a particular region because few other countries are directly exposed to the countries undergoing crisis, and to fizzle out. Here, US dominance serves as a dampener – since it is large enough to absorb shocks itself, it can prevent financial contagion from spreading. In contrast, when a crisis occurs within the US, it tends to spread everywhere, since every other country is heavily linked to the US. When US mortgage markets sneeze, everyone catches cold. I'd say that when the US sneezes everyone catches pneumonia. So in our view the question isn't whether the toxin is "diluted"*. Nor is it whether a denser network might be more or less capable of absorbing a shock. In our view the performance of the system in the face of a shock depends on the structural properties of the system, such as its topology, and the location of the shock within that structure: if it hits the periphery, the impact is narrow and remains in the periphery; if it hits the core, the impact is broad and emanates throughout the system. We have been told that problems in places like Cyprus have been walled off -- nodes in the network have been isolated -- but so long as a few isolated connections still exist that are difficult to cut, highly toxic shocks can pollute the rest of the network. In addition, as we saw today when "Jeroen Dijsselbloem, the current head of the Eurogroup, held a formal, on-the-record joint interview with Reuters and the FT today, saying that the messy and chaotic Cyprus solution is a model for future bailouts" and financial markets reacted negatively (the statement is being walked back), some connections -- those involving expectations -- cannot be severed in any case. Highly interconnected networks are highly desirable so long as (1) we can quickly identify trouble, and (2) nodes can be quickly and effectively isolated. But when those conditions are not present, the occasional highly toxic shock will cause quite a bit of damage. Despite being the conventional view (here's another example, also from yesterday) we think this is totally wrong. We think that the ongoing collapse in Cyprus is unlikely to have a major effect on the global economy, just as the collapses in Iceland and Ireland did not have a major effect on the global economy: the effects were devastating for those economies, and had some impact on the few countries which were strongly tied to them (mostly regional partners), but did not advance outside of that. 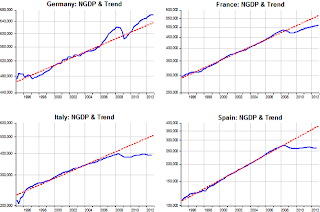 Indeed, as the eurozone crisis has deepened over the past few years, the world economy has gone from recession to growth and global financial markets have posted strong gains (esp in the West; less in the "Rest"). We don't think this is a coincidence. We don't think we have just gotten lucky. We don't think that we were saved by wise and prudential crisis management (does anyone?). We think crises in peripheral nodes are very unlikely to spread to the core of the system because of the structural properties of complex networks. We think, in other words, that the global financial network is not some abstract quantity, but something that can be modeled and understood. Thoma says that markets "reacted negatively" yesterday. The S&P was off 0.33% yesterday -- a totally normal fluctuation -- after increasing by 4.3% over the past month, during which time the botched Italian election and worsening situation in Cyprus were supposed to send financial markets into turmoil. As I write this, European markets are up today. So financial turmoil from Cyprus hasn't happened yet, just as it didn't happen last summer when the Greek crisis flared up. We wrote about that too, and said the same thing then as we're saying now, just as many economists and pundits argued then that we may be on the brink of doom just as they are now. We were right then and we're right now. Greece has defaulted at least twice since last May, yet the global economy hardly even notices. The Cypriot financial sector has essentially disappeared overnight (from a network perspective the links connecting that node have been effectively severed) and financial markets are up. I'm being pedantic about this because the message doesn't seem to get across. The belief that a crisis anywhere can lead to a crisis everywhere is so ingrained that very intelligent people don't even recognize contradictory arguments with supporting evidence when they are quite literally staring them directly in the face, as Farrell's precis of our research (and link to the article) was peering through the monitor right into Thoma's cornea. So I'm afraid I might have to be boring on this point until folks start internalizing it: all networks are not equal. *Thoma doesn't explicitly assign this view to us, but he quotes part of Farrell's summary of our article -- which says something different from what Thoma says -- and then goes on to the bit I quite as if we were making the a similar case. **In fact, we refrain from discussing viral contagion at all, as we believe it is not an appropriate analogy for financial contagion. We spent a bit of time discussing this in a previous draft, but as it was somewhat tangential to our main argument we eliminated it in the final version for reasons of space. The general point is that a virus can infect anyone it comes into contact with regardless of who that person is: a king is no less vulnerable than a peasant. Our argument is that not all financial crises are capable of infecting all nodes with which they come into contact. Most crises are not contagious at all, in fact. Our theory provides an explanation for that. But the virus language was referenced by both Farrell and Thoma, so I'll run with it for the purposes of this post. [The researchers] started by combing through the published lists of bankers who attended the 2006 American Securitisation Forum’s annual conference in Las Vegas and randomly selected 400 mid-level securitisation bankers from organisations such as Citigroup, Lehman Brothers and Wells Fargo. They then cross-referenced the names against publicly available data – extensive in the US – on subsequent real estate transactions and mortgages, and analysed whether those people had been trading properties, and whether they made or lost money. Next, the three economists repeated a similar exercise for a randomly selected group of 400 lawyers and 400 Wall Street equity analysts who were not involved in housing analysis. The aim was to see whether patterns among those real estate transactions were unique to the housing experts – or just reflected something that all wealthy professionals tended to do. The results were striking. Before conducting the research, the economists had expected that securitisation experts would be good at judging when to sell properties and how to avoid housing market losses; after all, they were close to the front line of the mortgage industry and supposed to know all about real estate. But in reality, the number-crunching showed “little evidence of securitisation agents’ awareness of a housing bubble and impending crash in their own home transactions”, as the paper says. The supposed experts “neither managed to time the market nor exhibited cautiousness in their home transactions”. Furthermore, they actually suffered bigger losses on housing than the random “control” group of lawyers who were not “experts” on housing at all. Here is the underlying research. The question I have is whether the top-level executives behaved differently from the mid-level folks. I doubt it, but it's certainly possible. "There are 47 percent of the people who will vote for the President no matter what…. There are 47 percent who are with him, who are dependent upon government…who believe that government has a responsibility to care for them, who believe that they’re entitled to health care, to food, to housing, you name it…. These are people who pay no income tax…. My job is not to worry about those people—I’ll never convince them that they should take personal responsibility and care for their lives…"
To commentators used to thinking of campaigns like a boxing match, [the 47 percent video] seemed like the knockout blow. It is always tempting for those following a presidential election closely — pundits, reporters and political scientists alike — to assume that every new twist is the proverbial game-changer. But in retrospect, the 47 percent video did not live up to the hype. Models predicting Romney's loss well before the video emerged -- those based on economic fundamentals -- performed very well. The 47% video had almost nothing to do with the electoral outcome. The rest of DeLong's essay -- essentially a defense of the welfare state against the entreaties of Nicholas Eberstadt -- is fine enough if a bit boilerplate. But if he's going to deliver lectures on how folks should understand the basic tenants of macroeconomics if they are to comment on them, then he should understand the basic tenants of political science if he is to comment on it. This is much closer to the Schumpeterian view of austerity than the Alesina view*. In fact, it sounds like nobody in Cyprus views this austerity as expansionary; hence today's rejection of the "bailout" plan, or whatever we're calling it. This was more like a old-school shakedown than anything in Alesina's model. This is why I think we need to be careful about how we use the language of "austerity". If I understand him correctly, Blyth's main thesis has absolutely nothing to say about the Cypriot case. And probably not the Greek case or the Portugese case or the Irish case. More traditional models of political economy have plenty to say about these things. So why are we insisting that very different things be described in the same way? Why not have distinct terms for distinct concepts? What's happening to Cyprus, Greece, Portugal, Spain, and Ireland is austerity. Not expansionary austerity. Contractionary austerity. And they know it. It's a grinding political battle over who bears the burden of debt. There's no hood-winking going on, no zombies ideas or confidence fairies or animal spirits or any other mythical beasts which need conjuring. Just old-fashioned materialist politics. *Also, this has nothing to do with Alesina's model and in fact basically none of the EU austerity plans have. Nor the U.S./U.K. plans. More about that in another day or several. Dan Drezner twitter-paged me this weekend regarding military Keynesianism. I suspect this is because he knows that I am writing a book on the political economy of American hegemony in which military Keynesianism plays the leading role. And as this is the second (third?) time Dan has pinged me about this, it is (past) time to respond. Dan's post this morning over offers the perfect opportunity. So does this mean Operation Iraqi Freedom doesn't matter? Of course not. Affecting the international system is a really high bar. World wars, economic depressions, industrial revolutions -- these things matter at the systemic level. It's rare that a conflict smaller than that would have systemic implications (though the Soviet invasion of Afghanistan does come to mind). Rather, the conflict's primary effects were at the national level. Iraq did have a profound effect on American foreign policy thinking. Which is the subject I'll tackle in my next blog post. Military Keynesianism suggests that Operation Iraqi Freedom had such systemic consequences in the form of the global economic and financial crisis of 2007-13. As I know people resist a direct attack, let me back into it with an analogous case: Vietnam. There is pretty broad scholarly agreement concerning three aspects of the Vietnam War. First, the US financed the war by running large budget deficits. Second, the deficit-financed war buildup sparked an inflationary boom in the US economy, which worsened the balance of payments position and led to a rapid increase in foreign claims on the American gold reserve. Third, the budget deficit-financed economic boom collapsed the Bretton Woods system as individuals, private institutions, and governments lost confidence in the dollar's peg to gold. The collapse began with the first massive speculative attack against the dollar in March of 1968 (an attack which led the Johnson administration to suspend all private dollar convertibility and sharply limit official convertibility). Thus, the US decision to finance the Vietnam War by borrowing rather than by raising taxes had severely negative consequences for the international system: it undermined global monetary stability. Now consider the Iraqi case. The sharp increase of military spending sparked by 9/11 and Iraq followed a massive tax cut (and coincidentally, we had a massive tax cut in 1964). Like Vietnam, therefore, the US borrowed to pay for the War on Terror. If the Vietnam War experience is any guide, this budget deficit must have had consequences for US macroeconomic and financial performance. The deficit was larger and persisted for longer than the Vietnam case. I argue that the choice to finance the War on Terror by borrowing rather than by raising taxes worsened the US external imbalance and the resulting "capital flow bonanza" triggered the US credit boom. The credit boom generated the asset bubble the deflation of which generated the great global crisis from which we are still recovering. Obviously, it takes a lot of heavy lifting to get from the war-related budget deficit to the global financial and economic crisis. (That's why I am writing a book. I will begin posting chapters in the next week or so here if you are interested). Regulatory considerations and the global savings glut may be important conditioning factors. But, the more I research this the more I conclude that these factors are less important than most of us believe. Hence my decision to compare the case to the Vietnam War experience and to the Carter-Reagan buildup sparked by Soviet invasion of Afghanistan in 1979. This was financed in the same way as the other two (budget deficits) and had the same economic consequences (housing bubble and the savings and loan crisis) as the War on Terror buildup. So, I would argue that Operation Iraqi Freedom had a huge affect on the international system: it generated the largest economic and financial crisis the world has experienced since 1929. This massive shock continues to ripple through the global economy four years later, as the EU's current efforts to resolve the banking crisis in Cyprus demonstrate. Henry Farrell has reviewed Mark Blyth's new book, Austerity: The History of a Dangerous Idea, which has not yet been released commercially. (I've written about Blyth's research program before. See here and more if you scroll down here.) As I've previously said, the book looks very interesting and I welcome the chance to read it. I love intellectual histories, and this looks like a good one. But Farrell's review increases my level of skepticism of Blyth's core argument regarding present circumstances, which had already been growing in me. Here's the gist of my concern: Blyth wants to advance an argument that the practice of austerity as a crisis response has ideational causes. That's why the subtitle of the book refers to an "idea". If true, this would call us to reconsider a good bit of the political economy literature, which has focused on materialist politics as filtered through various institutional structures as the most important factor in crisis policymaking. It's a provocative claim, and in making it Blyth does the dirty work of actually reading all those old political economists -- from Locke to Hayek and beyond -- who concerned themselves with the relationship between (sovereign) debt and growth. Historically, "austerity" generally referred to a set of policy measures designed to facilitate structural macroeconomic adjustment through internal devaluation of wages and prices rather than external devaluation of the exchange rate (which was often a metal standard originally, and a pegged exchange rate or currency board more recently). Most often, these were necessary because external liabilities -- public or private debt owed to foreigners -- had grown past the point at which service was feasible, and the highest policy priority was some sort of fixed exchange rate which made external devaluation undesirable. Austerity policies generally included cutting social spending, raising taxes, increasing interest rates to defend the exchange rate, and trying to boost exports (i.e. production) over imports (i.e. consumption). In other words, austerity was designed to reduce society's standard of living -- on purpose, but in a temporary fashion -- in order to get out from under the debt while maintaining the exchange rate. So the basic logic has nothing to do with spurring a short-run expansion; it has to do with avoiding a long-run collapse*. That doesn't mean it's good policy. But it does put things into perspective: governments who enforce austerity generally have no good options. Either they devalue their currency, which makes consumption more expensive; or they default on the debt, which makes immediately eliminating any external deficits (via tax increases and spending cuts) mandatory; or they raise taxes and cut spending and try to pay down the debt. All are forms of austerity. The choice between them is political, and is primarily a function of distributional politics (in my view, anyway). The underlying problem is the debt, and the debt is something more than an idea. So far I think Blyth and I are more or less in agreement. Back to Farrell's review, in which he applies something like the above description to some countries in crisis, such as Greece today: unless the Germans give them a bunch of money in some form or another, they face austerity (in some form or another). Blyth goes a bit further in the lecture (and presumably the book): even the "unless" here is wrong. If Germany gives Greece a bunch of money then Greece may suffer less but Germany will suffer more. The "austerity" hasn't gone away... it's only been redistributed. The idea of austerity is hardly the reason why Germany won't give Greece a blank check; the materialist reality is the reason for that. And in this case, the eurozone crisis is too big for Germany to manage. Heavily-indebted European countries, and their banks, are "too big to bail". Farrell suggests that countries such as the U.K. need not bother with austerity, but do so anyway, so this is where Blyth's book really does its work: these ideas are so powerful that they compel states to do disastrous things which are not in anyone's material interest. This is where either I misunderstand Blyth or Farrell does. Since Farrell's read the book and I haven't, I'll presume it's me. But I don't think the U.K. really fits the story. If austerity programs are bad then you shouldn't do them unless you really have to do them, in which case you are Greece and not the U.K. But, according to Farrell, the U.K. is engaged in austerity. This argument rests on a core empirical claim: that countries sometimes (frequently?) practice austerity when they don't have to do so. Over the past 15 years, the UK's budget as a percentage of GDP has averaged below 40%. As the crisis began, it was about 41%. 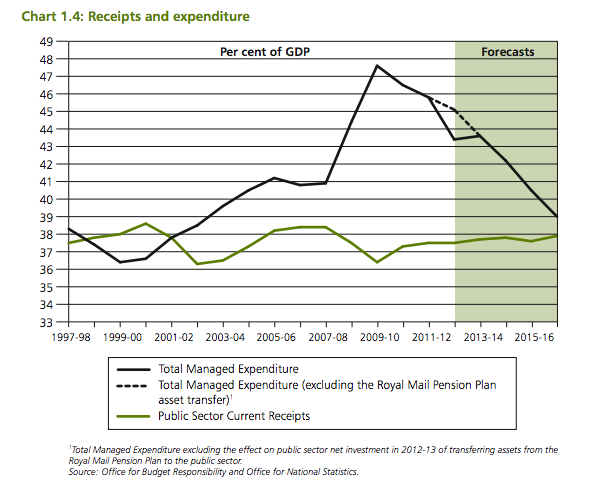 In response to the crisis, it spiked to about 48%, an increase in government spending of about 17%. That is the opposite of what Alesina recommends, which is a massive, immediate cut in spending. 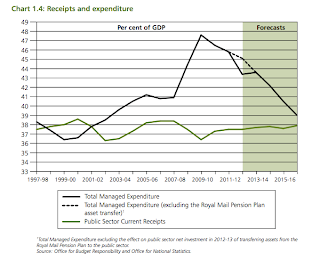 Since 2010, British fiscal expenditure has gradually declined about four percentage points (not massive or immediate) from an exceedingly-high baseline, so that it remains above its pre-crisis level. Tax receipts have stabilized and practically normalized, but the deficit remains well above the historical norm at 7-8% of GDP per year. I.e., the U.K. is accruing more debt rather than paying it down. The U.K.'s sovereign debt level is now the highest its been since the end of WWII. The U.K. is still hurting -- its economy was heavily dependent on the health of the financial sector, and its exports have suffered tremendously from economic weakness on the Continent -- but it is doing far better than most European economies. And the worst is probably over for the U.K. Full recovery may be excruciatingly slow but the situation does not appear to be deteriorating further (Blyth's hallmark of austerity). Meanwhile, any new debt accrued will need to be repaid, with interest. Bond rates are low now, but they will rise once the economy fully recovers, so even if taking on debt is cheap today it will be expensive to service tomorrow. The Conservative government has decided it would rather trim a bit now rather than push the whole bill back. The prudence of that policy is certainly debatable. What is not debatable is that this is in any way analogous to Greece's situation. Yet the U.K. policy mix is frequently referred to as "austerity" in the same breath as Greece, including by Farrell in his review of Blyth. I think this is mostly Blyth's fault: he's used a common word in an uncommon way -- again, in the lecture; we'll see about the book -- so when people see it they think he's referring to something more general: contractionary austerity, of the sort written about by Schumpeter, or maybe neutral fiscal consolidation (the Treasury View) rather than Alesina's narrow conception of expansionary austerity. I initially made this mistake as well. I wrote a draft of this entire post complaining that Blyth was guilty of conceptual confusion. He's not. But because he's taken the word "austerity" to mean something different from the general/historical understanding, he's given us a fairly difficult task to overcome before we can understand what he's really talking about. After enduring two recessions in the last four years, Britain is now well on its way into a third. The pain has been compounded by a succession of austerity budgets, in which Britain’s Conservative-led government has tried to hack away at spending. Repeated rounds of cuts have battered the British economy. However, Britain’s chief economic policymaker, Chancellor of the Exchequer George Osborne, wants still more pain. He is pushing the government to identify £10 billion more in cuts this year. I think Farrell's right on the substance: to the extent that Britain has restrained the growth of fiscal deficits that has had a negative impact on the economy. But they are far from a primary surplus and don't even (optimistically) plan on running one for another 6-7 years. They're not paying back externally-held debt. The most you could say of this is that the deficit spending isn't expansionary enough. There's certainly a case to be made there. It's my own personal view, in fact. But that political decision is best explained by materialist, not ideational, politics: the Conservative government and their wealthy constituents understand that when the bill does come due, they'll be the ones to pay for it, while the benefits from increased fiscal expenditure are unlikely to benefit them much. Cameron has courted the U.K.'s business community using naked language to this effect, and prominent business leaders have supported the cutting programs. They'd rather keep the future bill low, if possible, all things considered. Hence, the attempts to "hack away at spending". Hence the tax cuts for the rich and tax increases for pensioners in the most recent budget, which were praised by business and The Economist. All very materialist. So what does an ideational explanation (note: not necessarily Blyth's argument) bring to the table? Only that Cameron government thought this would be expansionary. But it didn't. Treasury reports under Chancellor Osborne revealed that they expected 1.3 million jobs lost. How about monetary policy? The U.K. is not defending a fixed exchange rate or commodity standard. Its interest rates have been near zero for years, and it has engaged in quantitative easing programs. The U.K. has recently hired one of the most expansionary central bankers in the world to try to spur on the economy, and are considering changing the Bank of England's legal mandate to give him more flexibility to do so. This central banker, Mark Carney, has said that he will pursue "radical" monetary policies in an attempt to generate growth, with no apparent concern for the value of the pound sterling. This is certainly something qualitatively different from what Greece is doing: devaluing internally in order to maintain a fixed exchange rate. It's the opposite policy. And so Blyth says in his lecture that the U.K. policies do not constitute the sort of austerity he's concerned with. He clearly distinguishes between the U.K. Conservatives' policies and the continental European policies; the implication is that the latter is "austerity" while the former is just normal distributional politics. But, as I mentioned before, that is not what "austerity" has meant throughout history (even Blyth's own intellectual history), where "history" is as recent as the Washington Consensus responses from 1980-2000 to crises in East Asia, Latin America, and elsewhere. And, arguably, the ongoing eurozone crisis, where the roles of Thailand, Indonesia, South Korea, and Malaysia are being played by Greece, Spain, Ireland, and Portugal; and the role of the IMF is being played by the Troika. It's not what folks like Krugman and Farrell mean when they talk about austerity now. And, frankly, I don't think Blyth's restriction on that definition is helpful. I guess it's possible that the German finance ministry actually believes that Greece's economy will grow following massive public sector cuts, but it is not necessary to believe that in order to explain Germany's actions. I look around the world and I see two kinds of (industrialized) countries facing crisis: those which have no choice but to engage in austerity, and so do, and those which do have a choice, and so do not. The former are the beleaguered eurozone states. The latter are large industrial economies which have responded to economic slowdowns with, shall we say, half-measures that fall somewhere in between the Keynesian ideal and the Treasury View*. A sort of "soft Keynesianism" which meets the partisan predilections of elected governments. The former Blyth characterizes as having been victims of "the greatest bait-and-switch in human history". Perhaps so (perhaps not, and Farrell questions this claim as well), but how they got into crisis ex ante has little to do with what is done about it ex post, and what is done about it ex post has little need for an explanation which is distinctly ideational rather than materialist. Why am I concerned by this? Because restricting austerity to Alesina's model muddies the water, and insisting that eurozone leaders fully bought into it is a big claim which, if true, would jeopardize a lot of existing literature. Moreover, it's deceitful marketing. Describing this version as "discredited" (or as a "zombie", as John Quiggin does in a self-promoting blurb) begs the question: what is it, exactly, that has been discredited? Alesina's model hadn't been at the time it was supposedly being tried. I agree with Blyth's incredulity that anybody could have believed it in the first place -- although he's the one claiming that they did, not me -- but experiments are conducted because the outcome is not predetermined. If this was a new beast, then it wasn't an old zombie. So I guess Quiggin was fooled by the narrowness of Blyth's definition as well. That makes nearly all of us. So the "history of a dangerous idea" is somewhat misleading: Alesina's theory wasn't formed in a vacuum, true, but it was a real break from past conceptualizations of "austerity". It was such a significant break that I don't think they really are the same concept. By referring to one subset of austerity theories -- expansionary austerity -- as if it was the only or even main one, Blyth appears to have made it tough on his audience. Maybe this is all resolved clearly in the book, and he simply elided that discussion in the lecture for reasons of brevity. I hope so, but if so that sense doesn't come out of Farrell's review. I'll read it either way, and I expect to enjoy it. I love intellectual histories like this, Blyth is a good writer, and many parts of his lecture are very good. I mean all that sincerely: I really enjoyed the lecture, and I anticipate getting a lot out of the book. I'm just not sure about the thesis. *The Treasury View is that fiscal stimulus will be neutral (multiplier of exactly one), so that version of austerity is a little less austere, but is still not expansionary. Most of the classics believed deficit spending would spur inflation, which is not expansionary in real terms. (Keynes' contribution was to point out that there would be no inflation if there were under-utilized productive capacity.) From what I can tell, none of the intellectual traditions Blyth covers in the lecture espouse expansionary austerity in a crisis except for Alesina. 1. Global inequality, which was expanding from 1800-1975, and receding since (due primarily to China and India). 2.a. The separation of the top 20% from the bottom 80%, partially as a function of college wage premium. 2.b. The separation of the top 0.1% from the rest of the top 20%, for reasons unexplained. 3. The rise of the top 1% globally -- the development of a new international plutocracy -- since... 1980 or so? For reasons that escape me he does not link the three together. It seems an obvious thing to do. It's what Oscar Landerretche (the other participant in the discussion) does, in the context of explaining outcomes in Chile. But he doesn't do it. This is something that has disappointed me about the conversation regarding American inequality over the past few years more generally. (I've written about it before.) Folks like DeLong, Krugman, Cowen, and others think in global terms quite frequently. But when they seek to explain the Great Stagnation and the rise of inequality they concern themselves almost entirely with local explanations. I think such analyses are very likely to suffer from omitted variable bias. Around the 43rd minute, DeLong takes a direct question about this from the audience. He answers it fairly well, but still downplays the role of the global economy in influencing outcomes in the US, favoring cultural explanations (e.g. explosion of CEO pay) and changes to marginal tax rates. He does not consider that these might be related to global dynamics either. If global forces eroded the bargaining power of American Labor, then maybe that's why society has tolerated the enormous increase in executive pay. If global forces are pressuring American corporations through new competition, then maybe we've cut top-end taxation in an attempt to gain back some competitiveness. So what the bad predictions tell us is that we are, in effect, dealing with priests who demand human sacrifices to appease their angry gods — but who actually have no insight whatsoever into what those gods actually want, and are simply projecting their own preferences onto the alleged mind of the market. When folks advocate incorporating "ideas" into social science, they usually mean using them as inputs in the interest-formation equation. And sometimes they are. I've changed my mind on a fair number of issues over the years, not primarily (I think) because of changed material conditions. But just as often ideas follow interests. Wall Street was never going to support a financial transactions tax. Main Street was never going to support cutting Social Security. The rise of "neoliberalism" may have been as much a result of changed material conditions as a cause of them. Etc. I think this is largely what Phil Arena and Thomas Oatley are talking about here (and see comments). But another key point of this quote of Krugman's is that it is (implicitly) talking about models. The bad predictions come from a belief that every country is like Greece or Argentina. What this crisis has done, as much as anything, is demonstrate that not all countries are alike. Given that, a similar shock can have asymmetric effects. This may seem like a simple lesson, but it's one that many have missed. The intuition behind it motivated a short article Thomas and I wrote last year when many others were worrying that a Greek exit from the eurozone was going to crush the global economy. The quality of the model is key. Posted by Rob Galantucci at 11:25 AM . US-EU Trade: The proposed US-EU trade agreement to be finished by the end of 2014? (here) That’s an ambitious timeline. With negotiations starting in June, that gives a year and a half. Compare that to some other multiparty trade negotiations the US has been involved in . . . that’s really fast. But, as has been discussed before on this blog, maybe there are things that are different about the EU deal (e.g., here). One example of this is labor’s posture towards the agreement. Statements from the Communications Workers of America, United Steelworkers, United Auto Workers and a number of other prominent labor organizations are positive, and suggest that a deal might operate to strengthen US labor standards. Not surprisingly, not everyone is on board with such a development: “It would be inappropriate to try to alter U.S. labor law through the back door,” said John Murphy, vice president of international affairs at the U.S. Chamber of Commerce (article here). In any case, US-EU negotiations already have a very different dynamic when compared to proposed trade agreements with developing countries. USTR on the sequester: That 1.5-year timeline seems even faster if the USTR is strapped for resources. The USTR general council has cautioned that the sequester could have an impact on the agency's ability to negotiate new agreements and initiate legal disputes to enforces existing ones (here). Phil Arena professes to be puzzled (or is he offended?) by Dani Rodrik's claim that rational choice political economy is "paradoxical." Rodrik has discovered apparently that our belief in our ability to use knowledge to alter policy outcomes is inversely proportional to our ability to explain policy outcomes. Phil asks, "where exactly is the paradox" in this? I'll give Phil the benefit of the doubt and assume that he realizes that the paradox for Rodrik lies in the unstated assumption that led him (and other economists) to political economy in the first place: the belief that through science we gain knowledge that allows us to control our world in order to produce better outcomes. This seems true in physics and even (in theory) economics (e.g., we did send men to the moon, and "we are all Keynesians now"). Rodrik believes this is untrue in political economy, however, where the entire enterprise is devoted to endogenizing policy choice. I understand why Phil analogizes Rodrik's confession to a conversion to mysticism. I even pretty much agree with Phil that the apostasy is rather odd coming from a person of Rodrik's stature. So, yeah, you had me at hello. But don't understand the subsequent effort to defend political economy against Rodrik's major point. In brief, Arena argues that ideas do too matter, that people do so change the world, and that scholarly inquiry does so have an impact. Phil seems to believe that this implies something about Rodrik's argument, but it seemed to me completely unresponsive to Rodrik's argument. So, I though it might be useful to outline where Phil's criticism of Rodrik left me a bit confused. First, the issue isn't whether political economists think ideas matter . The issue is whether ideas are independent of the processes we model and thus can be manipulated by outsiders to any greater extent than the actions of the people whose behavior Rodrik hoped to change but now realizes are responsive to vested interests. Rodrik seems to believe that ideas can be manipulated by outsiders to produce better outcomes. Hence, he seems to believe that ideas are outside of the political economy processes that otherwise shapes behavior and outcomes. One might wonder if Rodrik is about to repeat the quest that he has just abandoned. Second, the issue isn't whether human agency can bring about change or not. The issue is whether we can derive useful policy advice from a (general equilibrium) empirical model that accurately captures how the interactions among incentivized agents produce policy outcomes. Rodrik's point, and he is absolutely correct, is that we cannot. Such a model can produce redundant advice (do what you have an incentive to do and are thus already doing) or it can offer advice that the agents whose behavior we have modeled have no incentive to accept (do something that you have no incentive to do). Hence, the better we are at explaining policy choices as a function of political incentives, the less our models can generate useful policy advice. Even in models based solely on human agency. Third, the issue isn't whether scholarly inquiry has an "impact on the world." The issue is whether positive political economy generates knowledge that can be applied usefully to promote policy change. Rodrik argues, and reasonably so, that the answer is no. In short, Rodrik makes two points. One, positive political economy is useless for policy advice. Two, we can affect policy advice by changing how people conceptualize their identities and interests. For my money, this position defined by these two points is utterly incoherent. Thus, although I agree with Phil on the first point--if you are going to practice social science, you have to accept the implications and going all mystical isn't really useful--I really dont understand where Phil sits on the fundamental issues that Rodrik raises. Can we derive useful policy advice from empirically accurate general equilibrium models of politics? Are ideas exogenous to the political system in the way Rodrik conceives? Perhaps Phil would take a moment to respond. Posted by Kindred Winecoff at 10:39 AM . Don't have time for a more substantive post right now, but I want to keep the lights on here so I thought I'd pass along this interesting-looking report from CAP on the possible relationship between climate change and the Arab Spring. I've blogged before about how external monetary dynamics could have played a role by effecting commodity prices which helped motivate the uprising, but obviously Fed policy isn't the only thing that moves commodity prices. Draughts and other climate-related factors could very well play a role as well. Some, like Krugman, have argued that the European crisis is a technocratic failure, the result of quasi-religious beliefs in mythical creatures ("the Confidence Fairy") held by Very Serious People in government and the commentariat. If only they would just abandon their heresies and follow the One True Keynesian path, everything would be fine. The optimal policy is obvious and Pareto-improving -- more monetary stimulus, possibly combined with debt rescheduling and the end of fiscal austerity -- so all that is required is the fortitude to implement it. Others, like me, have argued that the European crisis is a political crisis, the result of a disjunction between the interests of the Eurocore (esp Germany) and the Europeriphery. Rather than postulate cognitive dissonance or willful ignorance (or something more sinister), I focus on distributional issues: either the Europeriphery's creditors are re-paid or they are not; either the Eurozone's macroeconomic imbalances are addressed by adjustment in Eurocore or by adjustment in the Europeriphery. Ultimately these are political questions, and political questions are generally decided by those with the most political power. In the case of the EZ crisis, any resolution must involve the European Central Bank, and the ECB has traditionally been influenced by Germany more than other member nations. There is no Pareto-improving policy -- what helps some countries hurts others -- so this is not a technocratic problem. 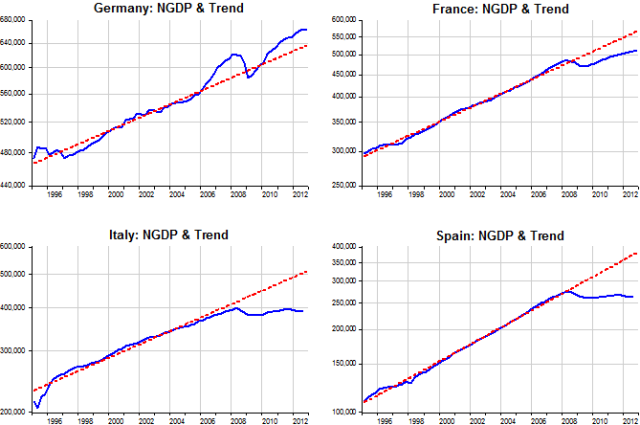 Germany is running above its nominal GDP trend; everyone else is below it. That means that further monetary stimulus will increase real GDP growth everywhere but Germany, which will instead experience higher inflation*. Germany does not want that to happen, because Germany does not like inflation. Germany has disproportionate control over the monetary authority of Europe. Therefore, the Europeriphery does not receive the monetary support which they want, because it would cause inflation in Germany. No parsing of myths necessary; it works without them. Also no moral lesson. Just normal distributional politics. UPDATE: Fixed some typos and poor wordings, which were both more common than usual (I think) and more egregious, and thus more likely to lead to misunderstanding. *Added at the same time as typo-fixing: Arguably an increase in German inflation would not facilitate the sort of adjustment which is needed anyway. Higher German inflation would depreciate the real exchange rate of Germany vis-a-vis the other members of the eurozone, thus increasing Germany's competitiveness in export markets relative to, say, Spain. Movement in the opposite direction is needed. Because Spain cannot devalue externally through a fall in its currency, it will have to adjust to a rising real interest rate with an even larger internal devaluation. That means even lower wages, and probably more fiscal austerity. If I'm right about that it's a potentially very interesting point which I've seen no one else mention.